Do you tend to fall asleep reading? I love reading in bed, either when I have just woken up or when I go to bed at night, BUT, invariably I fall asleep mid-sentence! Do you find that a good book will keep you awake and reading into the small hours, or do you fall asleep soon after you open the book? It depends very much on what I am reading! As a university student, I could cure insomnia completely by taking a philosophical text book to bed with me.... but if I stay up reading a gripping novel then I read and read and read for far longer than is good for me! I don't like to read in bed. Often, I find I am so tired that I invariably forget everything I read the night before. No, usually the reverse - I stay up longer than I should! As a kid I used to sometimes stay up quite late reading if I had a good book I was desperate to finish. 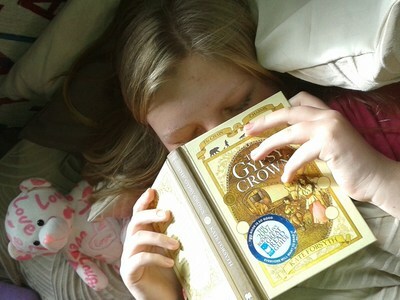 These days with early starts and two small children I get too sleepy and normally have to put it down after a chapter. I never actually fall asleep with a book in my hand though. I have honed an incredibly talent for staying up, no matter how exhausted, on reading far far in to the night. A good book frequently sees 2 or 3am.